A tyrant of a man, motivated purely by self interest, who 500 years ago incited the witch hunts, annihilating not only the Umbra Witches, but also his fellow Sages. Balder also used his magical abilities to take control of the captured Jeanne. 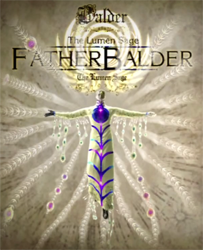 Named after the Norse God of Light, Balder showed promise in becoming a powerful Lumen Sage; however, he broke his clan's one unbreakable tenet of faith, consorting with an Umbra Witch, begetting a child. It was all a ruse to take possession of The Eyes of the World, the overseers of history that had previously been equally divided amongst the clans. During the following 500 years, Balder gathered the devotion of his pious followers. Now his ambitions have reached their climax, placing the last remaining Sage on the cusp of a universe anew, as he and Bayonetta, bearing his very own blood, become The Eyes of the World to resurrect Jubileus, the Creator, and unify the Trinity of Realities. Their fate nearly decided; who will truly see it through to the very end?